Review posted November 14, 2018. Riverhead Books, 2016. 208 pages. 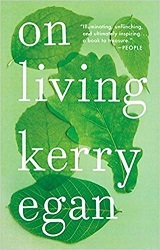 On Living is such a lovely little book! Kerry Egan was a hospice chaplain who listened to dying people tell about their lives and their stories. This book tells many of the stories of the people she met. But along the way, it weaves in plenty of wisdom about living. Hospice chaplains are sort of the opposite of storytellers. We’re story holders. We listen to the stories that people believe have shaped their lives. We listen to the stories people choose to tell, and the meaning they make of those stories. While religion plays a central role in spiritual care for many patients, it doesn’t for many others. Spiritual care, faith, and religion are not the same thing. Some chaplains might also be priests and pastors, but in their roles as chaplains, they don’t preach or teach. Instead, they create a space – a sacred time and place – in which people can look at the lives they’ve led and try to figure out what it all means to them. When you talk to hundreds of people who are dying and looking back over their lives, you come to realize something startling: Every single person out there has a crazy story. Every single person has some bizarre, life-shattering, pull-the-rug-out-from-under-you story in their past, or will experience one in the future. Every shopper in the grocery store, every telemarketer on the phone, every mother at school pickup, every banker striding down the sidewalk. Money, faith, popularity, beauty, power – nothing prevents it. Every one of us will go through things that destroy our inner compass and pull meaning out from under us. Everyone who does not die young will go through some sort of spiritual crisis, where we have lost our sense of what is right and wrong, possible and impossible, real and not real. Never underestimate how frightening, angering, confusing, devastating it is to be in that place. Making meaning of what is meaningless is hard work. Soul-searching is painful. This process of making or finding meaning at the end of life is what the chaplain facilitates. The chaplain doesn’t do the work. The patient does. The chaplain isn’t wrestling with the events of a life that don’t match up with everything you were taught was true, but she won’t turn away in fear, either. She won’t try to give you pat answers to get you to stop talking about pain, or shut you down with platitudes that make her feel better but do nothing to resolve the confusion and yearning you feel. A chaplain is not the one laboring to make meaning, but she’s been with other people who have. She knows what tends to be helpful, and what doesn’t. She might ask questions you would never have considered, or that help you remember other times you survived something hard and other ways you made sense of what seemed senseless. She can reframe the story, and can offer a different interpretation to consider, accept, or reject. She can remind you of the larger story of your life, or the wisdom of your faith tradition. She can hold open a space of prayer or meditation or reflection when you don’t have the energy or strength to keep the walls from collapsing. She will not leave you. And maybe most important: She knows the work can be done. She knows you can do it and not crumble into dust. She wrote this book when a patient named Gloria revealed that she’d been praying for someone to write her story. When she found out that Kerry was a writer, Gloria made her promise. While a few patients before Gloria had told me that they wished other people could learn from their life stories – had even given me permission to share their stories with others – it was Gloria and the promise I made to her that led to this little book. I had been holding on to patients’ stories for many years by then, the stories that patients had poured out and puzzled over, the stories they turned over in their minds like the rosary beads and worn Bibles they turned over in their hands. I hoarded them, locked them away in my heart. Often, but not always, my patients found some measure of peace as we talked. Often, but not always, their faith in something good and greater than themselves was affirmed. Often, but not always, they found strength they didn’t know they had to make amends with the people in their lives, and courage to move forward without fear toward their deaths. Always, they taught me something. I don’t know if listening to other people’s life stories as they die can make you wise, but I do know that it can heal your soul. I know this because those stories healed mine. Just as was true for every one of my patients, something had happened to me, too. What I thought of as the story that had shaped my life up to that point was one I was ashamed of. I thought I was broken and cracked and could not be put back together again, that I was destroyed at the very deepest part of me, and that this was something that could never be made better. When I started working in hospice, I didn’t yet understand that everyone – everyone – is broken and cracked. I’m not sure if reading a book full of stories told by the dying can make you wise. But I am sure that there is lots of wisdom in this book. Reading it provoked my thinking and uplifted my spirit.